Swordfishing has returned to South Florida waters. If big game fishing is your goal, you have got to try this. Our swordfish population offers big game fishing on a level with billfishing anywhere in the world. Swordfish – one of the most challenging of all the billfish – now, South Florida offers the chance for multiple catches in a single evening. Or, target monster swordfish employing newly developed daytime swordfishing techniques. To read more about swordfishing in South Florida, check out our swordfishing page. Our more common daily offshore fishing trips center around live baiting for sailfish, dolphin, king mackerel, wahoo and blackfin tuna. Of course the list of what we may catch is nearly endless. We utilize the fishing kite frequently, as well as downriggers while drifting or power drifting. And for the angler looking for ultimate challenges we also hunt these gamefish with artificial lures on plug, spinning or fly rods. In our hunt for dinner or new challenges, we sometimes look to the artificial reefs and wrecks that abound in South Florida. Here we anchor or power drift over structures from 35 to 450 feet below the surface hunting african pompano, cobia, grouper, snapper and assorted jacks. Who knows which delectable denizen of the deep will grab your live bait or lure far below the surface. As we get very near the inlets, we reach some of this captains favorite fishing grounds. Here is where the tarpon spend the winter. Coming from all along the eastern seaboard mature tarpon settle in Government Cut till early summer triggers spawning action. Whether it's live shrimp, crabs or mullet, Bouncer knows what the tarpon will be eating and where. And if it's fly or plugs you want to throw, Bouncer is an expert in which lure to use and how. This fishing is great day or night. And if you want something a little more challenging, then try for the sneaky snook Bouncer locates along the jetties. These guys are a reel challenge and great eating in season. Sometimes the ocean gets a little bumpy or inshore fishing draws the anglers attention. In these times, Bouncer can thrill you with jack crevalles that slam surface plugs. Or maybe you want seatrout and snapper for the fun or palate. Well if it was big game you wanted big tarpon roam the bay in fair numbers and smaller tarpon get crowded there are so many in the bay in summer. Yes! Bouncer does all these things regularly and they are all a lot of fun. When you fish with him you can even try a couple types of fishing in any given day. Who knows you may even score the coveted Gold Coast Grand Slam. This requires a sailfish, dolphin and tarpon in one day of fishing. Now that's variety. If we haven't tickled your desires yet, then I guess we will have to take you over to the Bahamas for a fishing fling over there this summer. Find out more about our summertime Bimini, Bahamas Trips! Below are some of the more common trips available. But Capt. Bouncer will be more than happy to mix and match, and custom tailor your next fishing trip to meet your desires. Swordfish - Red hot swordfishing is back in South Florida. Although available year-round, swordfish weather is best April, May, June, September, October and December . Tarpon - year round, large fish best February – June. You will be traveling in style with Captain Bouncer's lastest Dusky Boat, a 33' Center Console powered by twin Evinrude G2 300s. 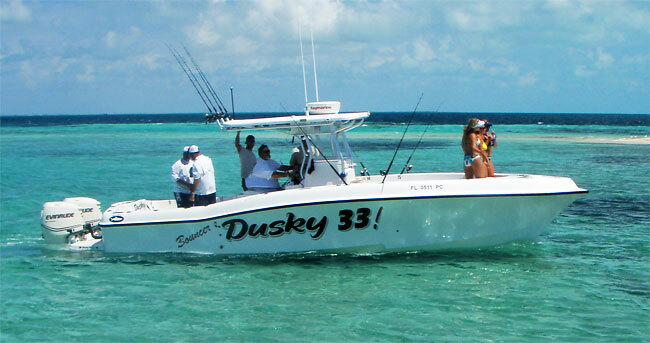 Bouncer's Dusky 33 is located only 5 minutes from the ocean at Miami Beach Marina, pier E, 300 Alton Road, Miami Beach, Fl. 33139 (click here for location map). From I-95 take 395 east for about 4 miles. At the end of the second big bridge turn right on Alton Road. 2 blocks down on the right is a 3 story building with Montys on the side. The parking lot is immediately after the building and the boat is directly behind the building.